The award was presented at a special London ceremony. 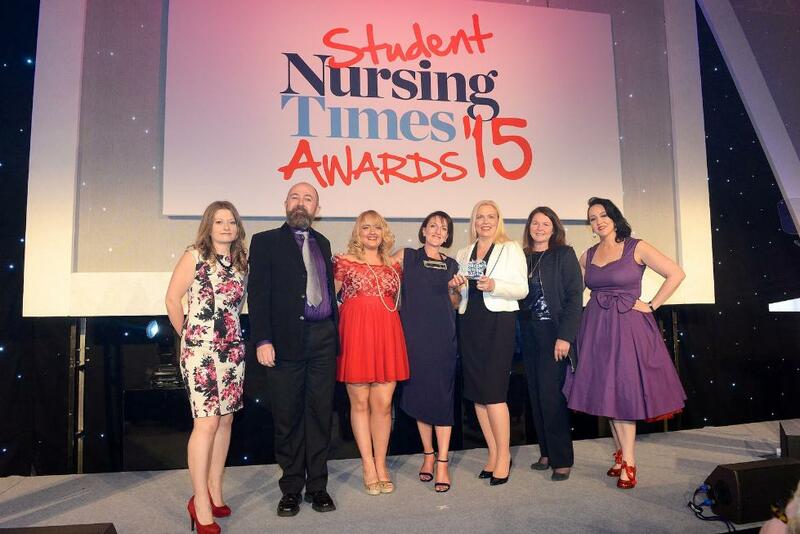 The University of Stirling and NHS Forth Valley have been judged Partnership of the Year at the 2015 Student Nursing Times Awards, held in London. The Awards celebrate the very best in nurse education, and the two institutions - sole Scottish winners - came top for their Psychological Trauma-informed Care Partnership. Linking Stirling’s School of Health Sciences Mental Health team and NHS Forth Valley Mental Health Services, it has led to the development of ground-breaking care within Scotland. Head of Stirling’s School of Health Sciences, Jayne Donaldson, said: “We are absolutely delighted to be have been recognised at the prestigious Student Nursing Times Awards, receiving the partnership award with NHS Forth Valley. “The partnership not only underlines our commitment and engagement with a key employer, but also emphasises our involvement to improve the lives of our community and to produce world leading research and education in this area. Professor Angela Wallace, NHS Forth Valley Nurse Director, said: “This is a great achievement and one of which both NHS Forth Valley and the University of Stirling can be justifiably proud. Congratulating the Award winners, Nursing Times and Student Nursing Times Editor, Jenni Middleton said: “These awards demonstrate how much qualified nurses supporting those training to be nurses and student nurses are achieving. “Every year we hear about fantastic new talent entering the profession, as well as excellent educators and mentors in universities and clinical placements. Stirling had been shortlisted for: Most Inspirational Student Nurse of the Year - Kyle West; Student Nurse of the Year: Adult - Kyle West; Education Provider of the Year (post-registration); Education Provider of the Year (pre-registration); Partnership of the Year: Psychological Trauma-informed Care - University of Stirling and NHS Forth Valley; Teaching Innovation of the Year - delivery of the Resuscitation Council (UK) Immediate Life Support course to final year undergraduate student nurses. Media enquiries to: Esther Hutcheson, Communications Officer on 0044 (0) 1786 466640 or e.l.hutcheson@stir.ac.uk. • The University is hosting a conference on 28 May, exploring the relationship between austerity, poverty and psychological trauma.